As Aragorn and the armies of Middle-earth stood facing the evil hordes of Sauron at the Black Gate so we writers stand before the greatest writing challenge of all time. In 32 hours, the battle known as NaNoWriMo will begin. Some of you have been ready to join the fight since December 1st of last year. Others may be standing on the sidelines of the battle not realizing what is about to begin. In case you’ve never heard about NaNoWriMo, let me explain. NaNoWriMo stands for National Novel Writing Month which is the slightly insane challenge of writing one 50,000 word novel in one month. Sound crazy? It is! But, it is also lots of fun. You get to connect with other writers in the NaNoWriMo forums and in your local area, enjoy the feeling of making so much progress in so short a time, and of course, write! It’s a great tool for letting your creative juices flow and finally silencing those excuses that keep writers from finishing their drafts. Last year, I completed my first novel thanks to NaNoWriMo, and every NaNo I’ve done since has helped me to grow and improve as a writer. So what will I be writing about in November? My novel is titled The Future Teller. It’s a dystopian about a girl named Neve who was infected with a virus which gave her the power to see into the future. I’ve had this idea floating around in my head for a few months now and thought NaNo was the perfect time to write about it. I know NaNoWriMo can sound daunting. I’m nervous, too! 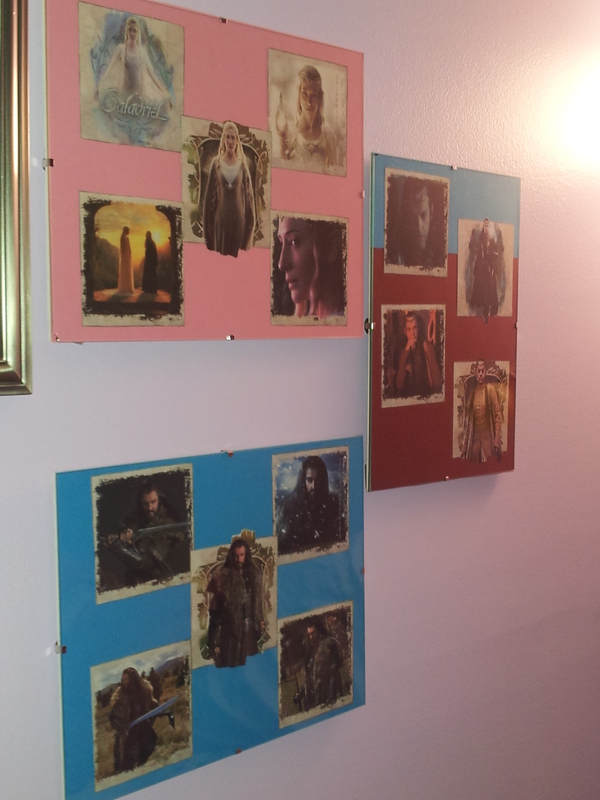 That is why, I’ve brought Aragorn in for a little pep talk. So what are you waiting for? Head on over to http://nanowrimo.org/ and sign up! Are you joining NaNoWriMo this year? If so, what is your novel about? Comment below and let me know! Top Writing Day: Wednesday was my top writing day with 1,327 words. What I Worked On: I worked on my Snow/Finley novel and a little bit of fanfiction. The Good News: I met and exceeded my goal this week! Yeah! The Bad News: I’ve been so single minded in writing my Snow/Finley novel that I haven’t gotten any of my other writing projects done such as Hobbit fanfiction for the Desolation of Smaug. Lesson Learned: When I wrote Homeland, I wrote a huge outline to go along with it, and never really used the detailed plot points I wrote. The outline was comforting to have, knowing I had to write a novel in a month, but not as useful as I had hoped. With Snow, I jumped into it thinking I’d never go far with the novel, and so I didn’t write an outline for it at all. Surprisingly, I’m doing okay without the super-detailed outline I did for Homeland, and I love the freedom of making it up as I go along! So, my “lesson learned” is that next time I start a novel, I’m just jumping into it, and only outlining later if needed! Top Writing Day: My top writing day was Friday with 2220 words. 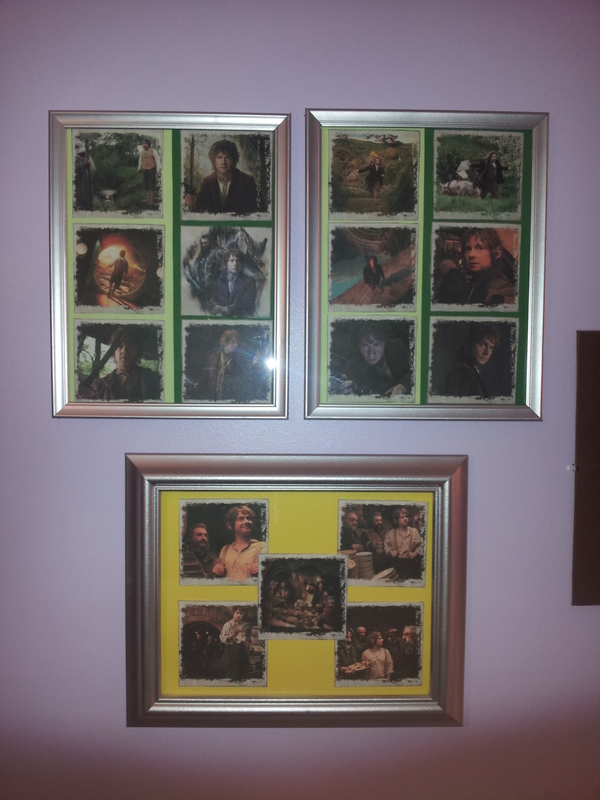 What I Worked On: I worked on editing my Victorian story and writing Hobbit fanfiction and one of my novel ideas. The Good News: I have gotten the first part edited! Yeah! Lesson Learned: While writing one of my novel ideas, I put in a scene, and it just wasn’t working. By trying to force it to work, I didn’t make my word count since I couldn’t keep writing because I had to keep fixing the scene. Finally, I removed the scene, moved to the next one, and voila! Everything was good again. So, my “lesson learned” is that sometimes the best thing to do is to remove the flawed scene rather than try to fix it, since it just didn’t fit/work with the story. Goal for Next Week: My goal for this week is, again, 600 words. Top Writing Day: Saturday was my top writing day with 1,666 words. 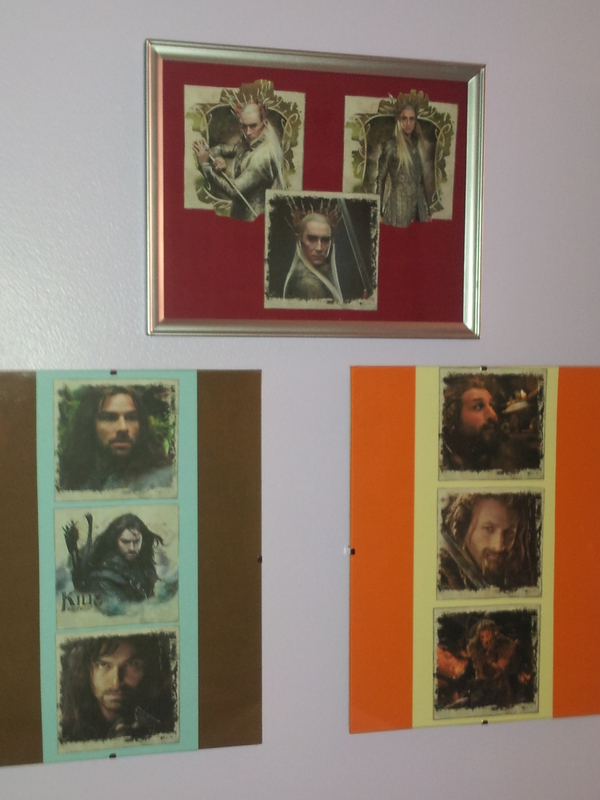 What I Worked On: I worked on a character interview for my next novel, and of course, some Hobbit fanfiction. The Good News: My brain feels completely rested from NaNoWriMo, and I’m ready to get started on more serious writing again. The Bad News: I had a chaotic week, so I didn’t manage to write every day as I was hoping to do. Goal for Next Week: My goal for this week is to finish up the character interviews and outline for my next novel. I started writing the MC’s (main character’s) this past week, and I want to have all the interviews done by December 18th-ish. No word count goal for this Wrap-Up since I’m anticipating more chaos this week. My brain is fried. Completely, totally fried. NaNoWriMo has done me in! I can’t write any more – at least for today. So, on account of my lack of brain power, I’m posting pictures. Hope you enjoy! 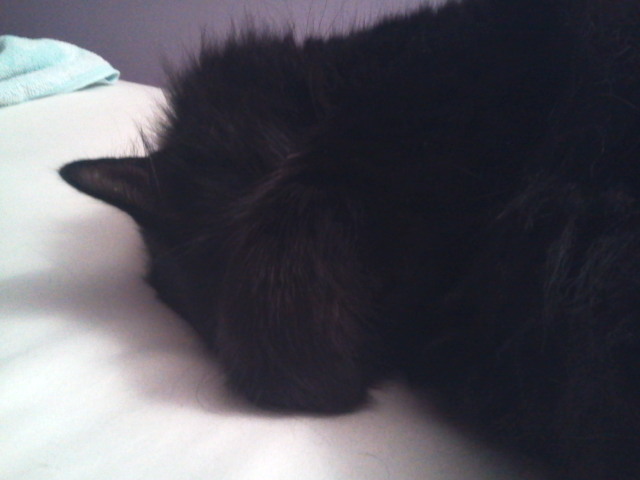 In case you couldn’t tell because of all the black fluffiness, her paw is wrapped around her head. 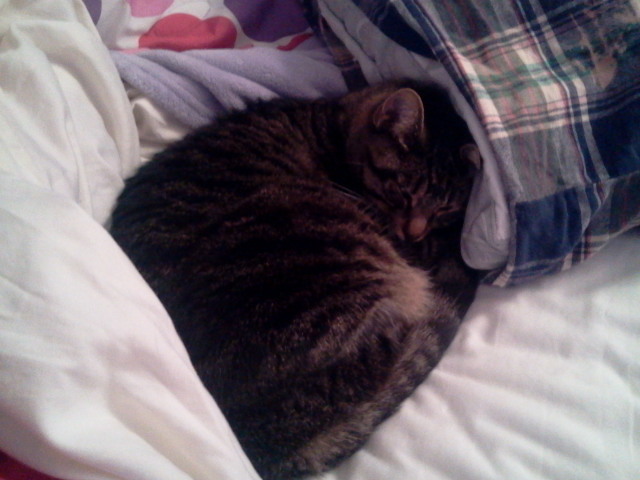 Isn’t she just so cute? Here’s a picture of Precious when she’s awake. She believes she’s a princess. Here’s a picture of my other writing buddy, Anya. She almost always sleeps with her head tucked in between her paws. It’s so cute! 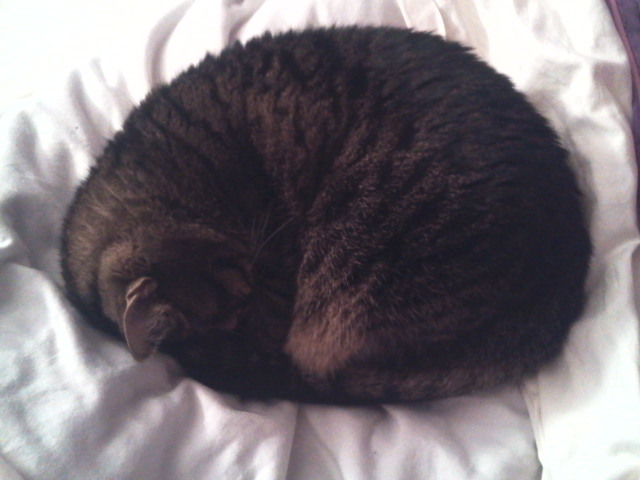 She demanded I post a second picture of her, too, so here’s another cute sleeping cat picture. The next picture is my official “Winner” screen on the Young Writer’s Program website for NaNoWriMo 2013! YEAH! I still can’t believe I won. 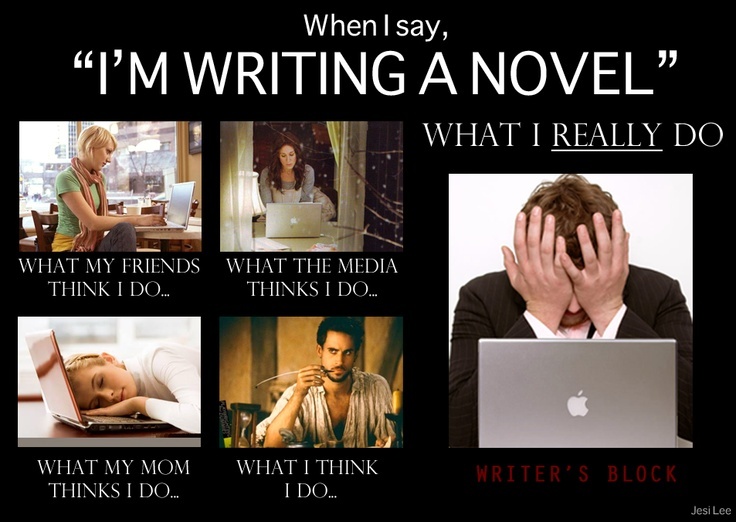 For the fun of it, here’s an awesome writing meme I downloaded from some blog a while back (I don’t remember which one). Feel free to download this one (which is what I do when I find a meme I enjoy!). 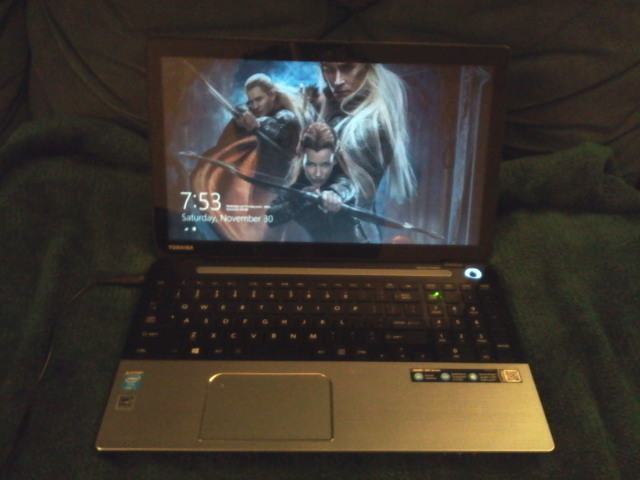 Finally, this is a picture of my new laptop I got for my birthday/Christmas. It’s a Toshiba Satellite, in case you were curious. 🙂 More about this next Monday when I post about buying a laptop for writing. Yep, that would be Tauriel, Legolas, and Thranduil from The Hobbit as my computer’s lock screen. Sorry for the non-writing post here, but hope you still enjoyed it. 🙂 Tomorrow I will be back on schedule with a writing post. Top Writing Day: Tuesday was my top writing day with 5,757 words. What I Worked On: I worked on my NaNo novel, Homeland, and after I finished NaNo, I worked on a couple of fanfictions I’ve been wanting to write since starting NaNo. The Good News: I finished NaNo, and I finished my novel! YEAH! I finished it up on Tuesday (hence the insane amount of words written on that day! :)), and I can’t believe I’m done. 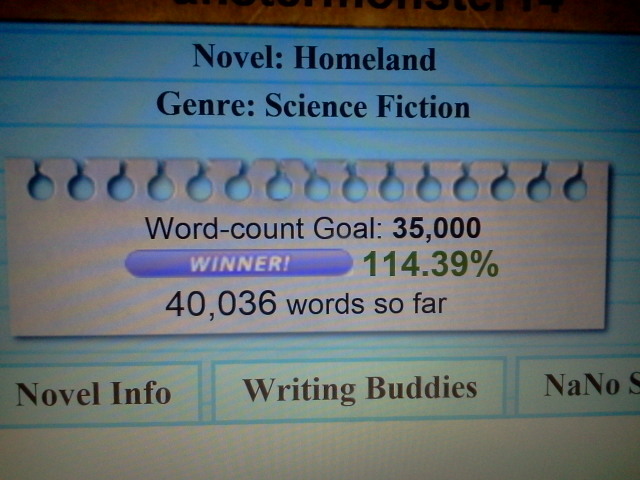 The final word count of my novel was 40,036 which was 5,036 words over my goal. The Bad News: I know that writing the first draft is only the first step. I have a boatload more work to do later when I edit and rewrite. Lesson Learned: I learned a ton from NaNoWriMo this year, and one of those things is the importance of not giving up on a novel idea, and to just keep writing. Goal for Next Week: I’m not planning on setting a goal for myself this week. After finishing NaNo, I’m giving my brain a bit of a rest by taking a week off from writing. I’ll probably still write some fanfictions for the fun of it, though. After today, there are five more days remaining in NaNoWriMo. I’m sure I’m not the only one thinking about how many more words there are left to write before midnight on November 30th in order to win. And for those of you unfamiliar with NaNo, winning means that you complete your novel’s word goal set at the beginning of November (50,000 words for adults, young writers set their own goals). Now, I don’t know about you, but I really want to win NaNoWriMo. But I guess, if for some reason, you didn’t want to win NaNo, you certainly don’t have to. For those of you who don’t want to win, I thought I’d be helpful and compose a list of four sure-fire ways to lose NaNo (please read this post in the slightly sarcastic tone it was written in :)). 1. Change your plot idea. If you’re looking for a way not to win NaNo, then switch your novel idea halfway through the month. In fact, the more you switch your plot idea, the more likely you’ll be to lose. You’ll get so far behind in your word count that you’ll never catch up. Of course, if for some reason you WANTED to win NaNo, then it would be best to stick with using the same old idea you started with. You are supposed to sign up for NaNo by November 1 (although it is fine if you sign up later). Of course, if you don’t ever officially join, you can’t officially win. And when you don’t sign up, you also can’t reap the benefits of winning like a “winner’s certificate, good for bragging rights on all seven continents, and starting December 5, many more winner goodies (including bound copies of your novel, writer tools, and publishing opportunities! )” (from http://nanowrimo.uservoice.com/knowledgebase/articles/161377-how-do-you-win-nanowrimo-and-what-are-the-prizes). Also, when you don’t register, you can’t receive any help from the NaNoWriMo forums when you’re stuck on a plot or can’t seem to find the right name for a character, and you can’t enjoy the social clubs where you can meet other writers who like the same things you do. If you want to lose, you definitely don’t want any support or encouragement. Of course, the most certain way to never win NaNoWriMo is to give up. Just step away from that keyboard or put that pen down, and stop writing! Tell yourself that you had no chance of making it anyway, and it’s for the best that you don’t keep writing. Make sure you come up with at least one excuse. Not enough time, not a great story or plot, flat characters – whatever works best for you is the reason you should use for giving up. Now, if you have changed your mind and decided you want to win NaNoWriMo, just do the opposite of what this list told you to do. But really, who wants to do that? 😉 Truthfully, though, winning NaNo is achievable. You don’t have to write brilliantly or even edit before turning it in for the final count. And then, even if you never do anything else with your novel, you have the satisfaction of knowing you won NaNoWriMo. Top Writing Day: Saturday was my top writing day with 1634 words. What I Worked On: I worked on my NaNo novel, Homeland. The Good News: I made my goal this week again, and I’m ahead of schedule for NaNo! The Bad News: I really don’t have any bad news this week. My novel is going great. Goal for Next Week: My goal for next week is the same as this week, 1,167. This Saturday, my local library held a NaNoWriMo workshop. This was the first time I’d ever been to something like this, so I had no idea what to expect. Would it be packed full of people, or would I be the only one there? Would we sit and write for two hours in silence, or would it be a formal class? Would there be other teen writers, or would I be the only one? Armed with my laptop, I nervously entered the meeting room, unsure of what I would find. Two ladies already sat at the tables. I knew immediately the one was a writer; she just had that “writer vibe” about her. The other lady had a giant feather pen, so I assumed she was a writer, too. As I was joining them at the table, the first lady, whose name I later learned was Tamarisk (which would be a great character name! ), asked me straight off about my word count and story line. I knew I was definitely at a NaNoWriMo workshop when the first thing I was asked about was my word count. 🙂 As I pulled my laptop out of its bag and chatted about NaNo, I started feeling a bit more comfortable. Soon after another lady joined us. She wasn’t signed up for NaNo, but wanted to learn about writing. Then the GREAT OFFICIAL ANNOUNCEMENT reverberated throughout the library. “The National Novel Writing Month workshop is now beginning. If you are here for the workshop, please make your way to the meeting room.” Two more people from the library wandered in, and when asked if they were there for NaNo, both responded, “What’s NaNoWriMo?” Both were interested in writing, but had no idea what NaNo was. Two teen writers came in a bit later. One of them was doing NaNo and just hadn’t officially signed up. The other hadn’t heard of NaNo before, but had a novel started. At the end, I wasn’t at all nervous and even jumped into the conversation a bit. I really enjoyed getting a chance to talk and write with a bunch of other writers and had an enjoyable time. I was really surprised that some of the people there didn’t know about NaNo, but I guess that’s what an event like this is for – to educate people and help them with NaNo. Tamarisk did a great job as leader/moderator of the group, and I learned quite a bit about NaNoWriMo from her 6 years of experience! I’m hoping that next year I’ll be able to go to another workshop and get some more writing done. Top Writing Day: Friday was my top writing day with 1539 words. The Bad News: I have more plot than words which means my novel will be completed after NaNo. I was hoping to have it completed by the end of November, but that probably won’t happen. Lesson Learned: I have been practicing self-discipline this week. This past Tuesday, I was suddenly inspired with a new novel idea. I’m trying hard not to chase after it and to complete the one (my NaNo novel) I’m working on first. Goal for Next Week: My goal next week is my current NaNo word count goal, 1,167 words a day. If you’d like to share your word count with me, comment below, and let me know what it was.